"ISLE OF BARRA" knitted into hat, three times round rim. 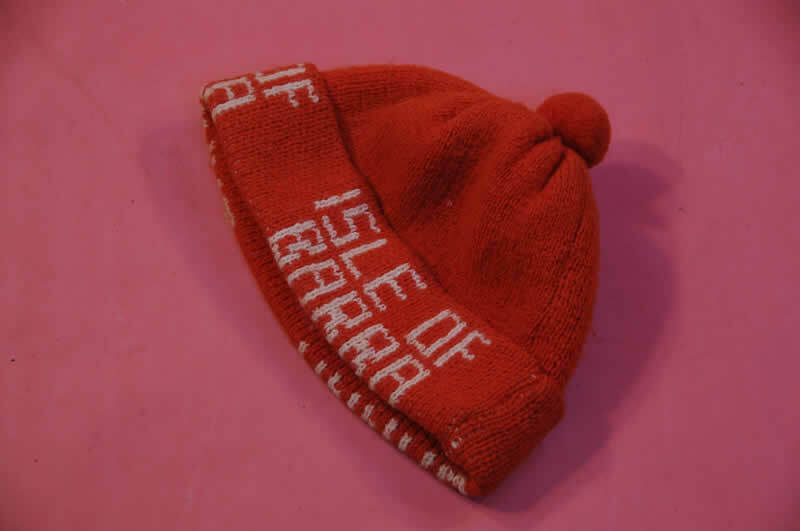 Label inside bonnet reads "ISLE OF MULL KNITWEAR ARGYLL SCOTLAND PURE NEW WOOL HAND WASH ONLY"
At the time of writing (2010) most folk in Scotland will have heard of Tom Weir, though in years to come the memory will fade, so we thought the following obituary would encapsulate Tom's life. Tom Weir, the broadcaster and naturalist whose rambles over Scotland's landscape captivated a generation of television viewers has died at the age of 91. Made famous by the STV series Weir's Way, the renowned climber and author died at a nursing home in West Dunbartonshire. An unlikely candidate for screen stardom, Glasgow-born Weir became a household name through the 1970s series which catalogued his walks across Scotland and the local characters he encountered. But the gentle tales of countryside life won a new audience in recent years when re-run by STV. Young people not even born when the series first aired demanded to see more, and earlier this year the broadcaster released a five-disc DVD set of the show to suit the digital era. Weir had been in failing health for some time and he died on Thursday in Sunnrngdale Retirement Home in Balloch, where he had been a resident for three years. His wife, retired primary school headteacher Rhona Weir, 86, yesterday paid tribute to her husband of 47 years who she described as her "lifelong soul-mate". The widow, who still lives at the home she shared with her husband in Gartocharn, West Dunbartonshire, said: "He was a great man, my lifelong soulmate and I adored him. "In a way this was a release for him because he had lost the power of his legs and couldn't go out and explore the outdoors he loved and lived for. "Our marriage was a great partnership and it was based on complete trust of one another. I will miss him very much." Weir was born in Springburn in Glasgow in 1914, and was the younger brother of actress Molly Weir, who played Hazel the McWitch in theSOs children's TV show Rentaghost. 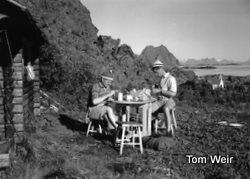 After serving in the Royal Artillery during the Second World War, he worked as a surveyor for the Ordnance Survey before embarking on a full-time career as a climber, writer and photographer. The environmentalist Dr Adam Watson was a lifelong friend of Weir's and met him while walking in the Cairn¬gorms in 1947. He said: "I was 17 when I met him and I was struck by him because he was such a confident all-round moun¬taineer and also had a great interest in natural history. "He was a brilliant conversationalist. When he came into a room we was a small man but he had a great confidence and people just stood listening to him. He had a great knack of speaking to total strangers and putting them at ease." Weir was a staunch campaigner for the protection of the Scottish environment, and wrote a column for The Scots Magazine for over 50 years. He received a John Muir lifetime Achievement Award in 2000 for his environmental work. Nigel Hawkins, director of The John Muir Trust, the wild land charity which manages eight estates in the Highlands and islands, said Scotland had lost "a great man of the hills". He said: "Tom Weir was a doughty champion for Scotland's wild places and was one of the first people to realise the importance of safeguarding our wild and beautiful landscapes for their own sake as well as for the benefit of present and future generations. "He spoke and wrote with great beauty about Scotland's wild places and won many hearts to the cause of looking after this wonderful inheritance." The broadcaster and naturalist was also celebrated in the song Tom Weir written by Edinburgh musician Sandy Wright and performed by the band Aberfeldy. An STV spokesman said: "Naturally we're all very saddened to hear that Tom Weir has passed away, and our thoughts are with his family at this sad time. Weir's Way has become one of Scotland's classic television programmes andTom was a talented and much-loved broadcaster."